Lobster Burger Salad, shortened to “LBs” but pronounced “pounds”, opened quietly in the Financial District this summer. Nonetheless, my food loving friend caught sight of their wrought iron lobster signage and we were immediately excited. However, with the luxury ingredient, prices would be steep so who knew when we’d have a special occasion to try the place? 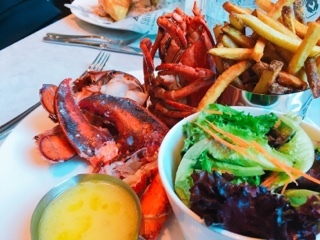 Trying to combat the mentality where lobster needs to be charged at expensive market prices, LBs devised a menu with four mains all costing $22: a 1.25 lb lobster, lobster roll, lobster salad, and the sole non-seafood dish … the 6oz. bacon cheese burger. There’s also a lobster poutine ($20) for sharing and a selection of larger 2-6 lb lobsters ($75 - $185). I wasn’t leaving LBs without having the lobster, so the 1.25 lb dinner was a good choice. The crustacean arrived separated with shells split, eating it was a breeze. There was more than enough melted butter accompanying the dish, but really with sweet succulent lobster meat, I rather have it plain. And it was cooked well, not a rubbery bit at all. Although I wouldn’t suggest using them for the lobster, LBs also offers a selection of premium sauces (truffle aioli, lobster butter or gravy) for an extra $4 as a special fry dip. Personally, I found the side fairly salty already, so it really didn’t require any further condiments. 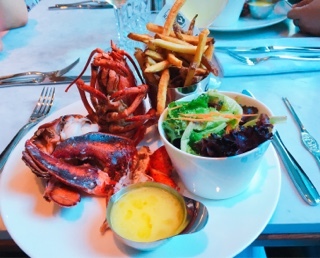 What a delicious combination: lobster and fries. My friend’s lobster roll looked great with its butter toasted bun and ample amount of meat. Since the roll is offered at their takeout window during lunch for $16 (including chips), I’ll need to arrange a lunch date soon. While the mains are relatively affordable, LBs cocktails is where margins are made. 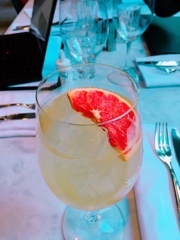 The citrusy grapefruit cordial in the rich girl ($16) goes nicely with the lobster and the mezcal is spiked with a mellow chili so there’s an interesting aftertaste that turns an otherwise plain drink into something special. As soon as you step into the restaurant the smell of cooking shellfish is intoxicating - perhaps one of my favourite food scents. With plenty of seating and reservations accepted, enjoying a lobster could not be made any easier.